Seriously. I’ve had one of these for about a year and it’s a blast. 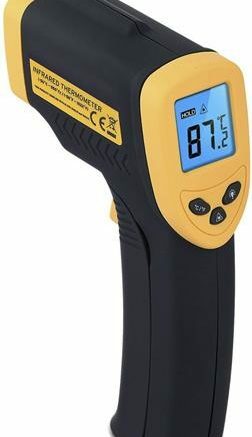 Yes, I know this Smart Sensor Non-Contact Digital IR Laser Point Thermometer is supposed to be a serious tool but once you get done checking the temperature of your refrigerator you’re going to want to play with it. Just point and shoot, and you’ll get temperatures in Fahrenheit or Celsius. The idea of an infrared thermometer is dead simple. Everything in the universe (except black holes) gives off infrared radiation. When you’re on a planet like Earth that has air, that infrared radiation corresponds to heat. This device detects the infrared radiation on the surface of something and does some math to tell you its temperature. It’s not affected by hot air in between it and the thing you’re measuring, and it can be quite a distance away. I’ve measured temperatures from about 4 feet away and I think you could go further. The thermometer comes with a built-in laser sight so you can aim it, but you can turn that off in case you’re measuring something you shouldn’t point a laser at (like a child.) It takes about a second to get an accurate measurement. And I have to tell you, boy is it fun. Point it at your computer to see how hot it’s running. Point it at a pot to see if it’s getting ready to boil. Point it at your friends (not at their eyes) and see if they’re running hot or cold. I swear when you get this thing you will not put it down for an hour. A couple of things I ought to tell you. First is that I’ve found that it’s not as accurate at temperatures above 400 degrees. I’ve tried it to measure the temperature of the oven and it varies by about 15 degrees on two attempts, up or down. My guess is at such extreme heat it is actually affected by the air in between. Also, it’s a surface thermometer, it only measures the temperature of the surface of things. That means it’s not going to tell you if you have a fever. Don’t use it for that, use something else. But other than that, go nuts! It doesn’t seem to be affected by fur (I took the temperature of the cat) and it does seem really accurate. I measured it against weather stations and it seems like it’s really working. In the summer in our Southern California labs it told me the sidewalk was about 130 while the black pavement was about 160. Not hot enough to fry an egg, but getting close! This is one of those things that I am sure you can convince your significant other that you need, and then you can get literally hours and hours of enjoyment from measuring random things. As an extra added bonus it is a sort of trigger-shaped thing with a laser, so if you’re really into cosplay you can use it for that too. Check out this Smart Sensor Thermometer now at Solid Signal!